We send out four newsletters a year. Each features a one page story that allows you to learn about one aspect of our ministry. Over time, we hope you'll get to know us and consider how you want to engage with us, if you want that. Please sign-up today. If you like to read things more often, please consider subscribing to our blog or follow us social media. Without your gifts, there is no SYM. We invite you into ministry with us! Your donations matter to our clients every day. You can specify how you would like your donation to be used. Joe appeared on the street in late November 2014. He seemed nice – but little did we know what was about to take place in his life, and what role Street Youth Ministry would play – just by being there. Joe appeared to us as a traveler. Travelers are usually high-functioning and focused, intent on getting what they need before moving on. He said he was leaving in just a few days, but those days came and went, and he was still with us. There was always something else he needed before leaving town. Then Joe fell into a serious drug habit. He began to smoke K2, a new and cheap synthetic drug that has invaded the streets of Austin. He used heavily. We checked on Joe periodically. He wasn't mean or violent, like some of our clients on K2. In fact, he grew quieter and more distant. He rarely talked to us, and his actions broadcast his priorities: find drugs, do drugs, find money for more drugs. Occasionally he would talk, and when he did, we would remind him of the good things he wanted for himself: new glasses, better gear, warmer clothing. Joe snapped out of his stupor as spring came near. 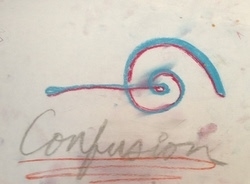 He got new glasses and began to question his direction. Our inquiries were often met with, "I just don't know. I just don't know what I'm doing with my life." He seemed to realize that the journey of self-discovery that had brought him to the street had derailed, and he was lost. Then – finally -- came the admission: He was depressed. Calls for prayer went out to our prayer team. We followed up with guidance counseling. We walked alongside him and helped him examine his thoughts. Soon, we saw a marked difference! Joe became aware he was no longer a kid. His juvenile behavior looked wrong to him. He began to reappear at some of our indoor events. He opened up more, sharing how a series of family difficulties during his childhood led to rebellion, misbehavior and ultimately two years in prison. Sitting on the streets doing drugs was just an extension of that downward spiral. Now, Joe's outlook is changing, gradually. He wants an adult relationship with his father. He realized his father was also shaped by his own family, and Joe now has compassion for him. He sees that living on the street has been an important part of his self-discovery, but that he can no longer stay in Austin. He acts differently now. He may struggle with depression again, but he's having great days. He's thinking more and discovering new desires for his life. He's encountering spirituality and hope. We're not fixers per se. We offered guidance and encouragement each of the more than 50 times we met Joe. It's planned into every encounter, daily activity, giveaway and special event we hold. It’s no accident there are hundreds of stories like Joe’s. Celebrating transformation is one of the many joys of this ministry. Thank you for being a part of it! 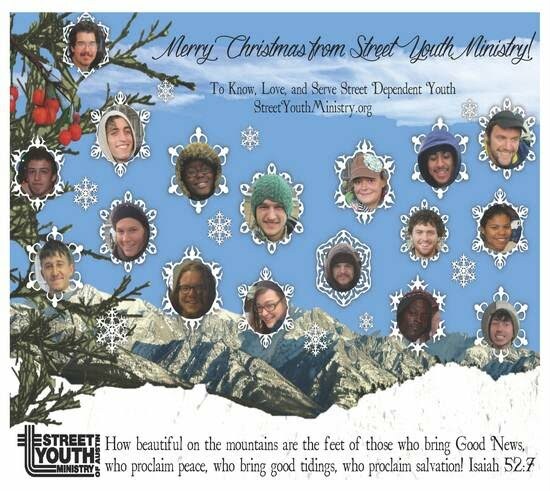 545 homeless young people under 30. That's how many people we have shared a message of belief, taking one step at a time, and setting flexible paths toward a better life this past year! And the story below shows how we get higher impact through multiplication as three clients help one another to faith! And keep going for an awesome treat from our graphics design volunteer just for you! Multiplication: How clients help each another to faith! If you’ve been following the ministry, you know it’s been a very difficult year because of a terrible drug called SPICE. It’s been dominating the scene for 15 months. It creates images similar to those from old “Skid Row” that I remember as a kid … people lying about, passed out, seemingly unable to care for themselves at all. It’s a very cheap drug with an almost instant addiction. Its makers and distributors prey on the poor. Despite the challenges, we labor on. Creeper was very addicted to SPICE and spent the better part of the summer flat on his back or wandering around under the influence. We ministered more than 40 times to him, both spiritually and practically. He didn’t seem to make any progress or even express interest in change. Perhaps our hope for his rebirth was weakening. And then he disappeared. The picture at the top of the email is Creeper on a very good day in the summer. Six weeks later, I got a message from someone named Whit. I didn’t recognize the name, but I recognized a familiar face when I looked online. So I responded, “Hey Creeper! How are you? Where are you?” The response told me so much! “Creeper is gone. Please call me Whit! I’m in Fredericksburg. I’m working at a barbeque place.” Street youth take on a persona, including a street name, when they come to the street. It serves them well in many ways, including protecting their inner selves from moral injury from what may happen to them on the street, or what they may do while there. By saying “Creeper is gone,” Whit was telling me that he had left that persona behind. This was exciting! I asked, “How can I be praying for you? And how is your drug use?” Whit replied, “Terry, I don’t use drugs anymore. I don’t even smoke! I moved back with my dad, brother, and 97-year-old grandma. I’m going to church with my family, and I’m going to be confirmed!” Wow! Creeper hadn’t shown significant interest in faith in our encounters. So something had changed! 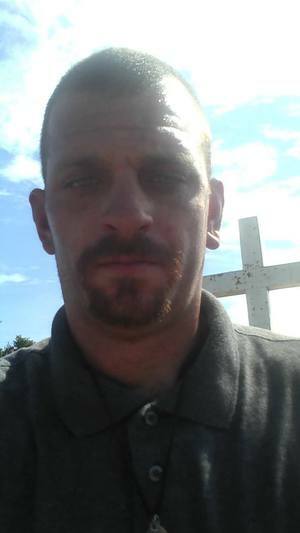 Whit after being sober, working and reuniting with family!I continued, “How did this come about?” Whit explained, “Two friends on the street had really deep conversations with me on many nights. They convinced me of God. I was baptized as a kid, so I decided to go back. I’ll be confirmed in my Catholic church soon.” I was excited to know his path to faith. And the two people he named were both clients, also addicted to SPICE for the summer. We’ve ministered to the two of them for more than 110 hours! The picture is one Whit sent me recently! I shared the news with our clients at a recent Bible study and they were so happy for Whit and filled with hope for themselves! Rarely a week goes by that someone isn’t calling, messaging or emailing to share important changes in their life! Our model is to spend time with our clients. We provide practical help, but the most important thing we do is keep the conversation centered on things that matter, our belief in our client’s ability to change, and encouragement to take small steps. These seeds cause conversation at all hours on the street and all across the country. Wherever our clients travel, the Gospel gets a foothold in dark and dangerous places where we would never go! 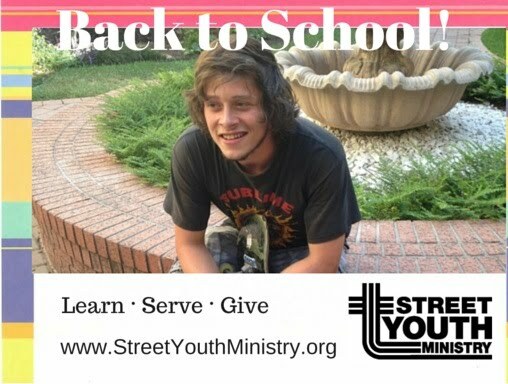 This has been our ministry strategy from the beginning, and it’s wonderful to discover that Whit was saved by conversation with his two friends (also clients) late at night on the street! Our hope comes from an eternal and loving God who has never stopped loving every street kid, no matter what’s been done to them or what they’ve done. A Father who sent his Son into the world to set the example of seeking the lost. A Son who has already healed every wound and forgiven the sin of every street youth who would call His name and turn back. It’s the wonderful message of Christmas for us all, and I pray your family and loved ones are surrounded and comforted by this beautiful message this holiday season and all the coming year! P.S. On Dec. 1, I got a phone call from one of the friends Whit said helped him to faith. He also has come to stronger faith! He called to apologize for being difficult with me on our last encounter. He has stable housing, is sober, and is reading his Bible regularly! I met Gage for the first time only a few weeks ago. He was frustrated and trying to finding shoes so that he could work. He was wearing flip flops that were biting into his feet. I offered to walk with him to our tiny office and let him look through some donated shoes. He agreed. Not a big deal… or so I thought. I tried to chat with Gage on the way. One question I asked was, “How can I be praying with you?” “I’m good” was the quick answer. As we continued on, I stopped many times to check in on other clients. When I started the ministry in 2008, I can remember walking up and down the drag several times in an hour trying to meet clients. Now it can take an hour just to walk one way down our “area” because we stop and check-in with everybody. Gage watched and waited patiently. Eventually, Gage and I reached the office. He went to work digging through a big box of black walking shoes. The box of shoes had been destined for a trash heap, leftover and no longer needed by a college marching band; but a student volunteer had hauled them in her car a few hundred miles for our clients instead! Gage found shoes he thought might work, and I gave him some socks as well--purchased for us on smile.Amazon.com by a supporter. He rubbed the cuts on his feet, pulled on the socks and tried on the shoes. He exclaimed with a big smile, “You have no idea how long it’s been since I had shoes that fit right!” He slipped the offending flip flops into the trash can with great satisfaction. I offered him anything else he might need from the various boxes of donated toiletries and clothing. He gathered a few things and turned to leave. 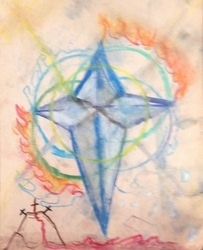 I asked again, “How can I be praying with you?” This time, he paused and then said, “Help to forgive.” I agreed and then asked, “Do you want to share for whom?” To my surprise, he did and began telling me about his father and why he left home at fifteen. I provided guidance counseling on forgiveness, including integrating the Gospel and some of his own faith beliefs he had shared. He left with a lot to ponder. In the days that followed, I had the chance to provide Gage job counseling at our weekly Job Club gathering. The thought of taking a “soul-sucking” entry level job paralyzed Gage. The anxiety was palpable. So I suggested college as a possible way to gain confidence and open different doors. “I really want to, but I just don’t know how to overcome the hurdles to get in.” Fortunately, I have learned a lot from clients who have braved the college hurdles before, and I was able to give him direction right away. Long story short, he got help from social workers to get enrolled in ACC, got his financial aid, and now he’s going college classes this semester! His textbooks are on the way, too - provided by our college textbook program donors. Gage is also one of the more talented guitar players I have heard pick up one of our guitars. He’s a declared double major in engineering and music! We wish all of our stories turned out well so quickly, but our clients are creative and resourceful--we know there is always a way! You can pray for Gage (that’s his real name). He gave permission to share his picture and story. In Kingdom values, what was the value of those shoes, socks, toiletries and college textbooks? I think they will turn out to be priceless, and I am so grateful to all of you for your prayers, gifts, and support! "Julia" recently came to a Street Youth Ministry event where we hosted a cooking activity. She knew quite a bit about baking and suggested we add brown sugar to a dessert to give it a delicious crunchy topping. Our volunteers went along with the idea, and the result was awesome! But knowing her background, it left me wondering how she had ever learned such a thing. You need to know that Julia isn't a real name, and to protect our relationship with this 20-year-old, and with all our clients, we fictionalize our stories. But I'll guarantee there is a Julia out there on the streets. Julia is a handful. So much so, in fact, that she can't get the help she needs very many places. Many service agencies have had to ban Julia because of her behavioral problems and inconsistencies. We've asked her to leave on occasion, too, but we have the liberty through Christ's grace to always leave room for her to ask to come back. And she always has. We don't know that much about Julia's story. She's not open to sharing often. But based on what we do know, it's a miracle that she tells anyone anything. When she was young, the household she grew up in fell apart. One parent wasn't present and the other ended up homeless. As promises were broken and expectations disappointed, her family unit disintegrated. Despite this, we have never heard Julia say anything bad about her parents. As an angry, young girl, Julia was taken into state custody. We know someone wanted to adopt her, even as an angry teenager, but unfortunately it couldn’t happen. We can only imagine the pain of that rejection and disappointment and yet we've never heard Julia complain about it. impolite or impertinent because she prays for more drugs. But she also brings an honesty and strong spirit into the room that we appreciate. for a few days. But so far, relapse has been only a few days around the corner. We pray and long for the day this won't be the case. We know Julia has a desire to become a pet groomer. On those days when it's possible for her to dream about the future, she shares her hopes for what that could be like for her. Surely it's hard for her to share these types of dreams when so many others have been crushed, but we love to listen to them on the rare occasions when she can. justifies all sorts of misbehavior, but we also know that she treats us kindly, respects our boundaries, and admits to many of her wrongdoings when others cannot. So far, Julia has not been able to integrate the idea of God's forgiveness and grace into her life, but she allows us to share the Gospel with her regularly. Live in harmony with one another. Do not be proud, but be willing to associate with people of low position. * Do not be conceited. I drove downtown at eight in the morning to see our clients. No shelters had opened in the neighborhood that night, and there was ice on my truck windows. I braced myself. Clients would not be in a good mood. Two clients met me just as I got out of my truck. One came right up to me and gave me a hug. I asked what it was for. He said, "There are people who pass us by all the time. Today especially here in the cold. But you and your volunteers come down 6 days a week to help us.. Thank you." Oscar was bundled in a coat, gloves, scarf and hat we had given him. Shaking his hands and arms, stiff from the bitter cold, he said, "If someone will rescue me from his hell, I'll never do drugs again." I looked into the part of his face showing and considered a response. "What if that person were you?" I said. He retorted, "I mean it. If I can't get out of here, I feel like doing drugs all over again." Oscar has been sober for three months or more. He has been coming to prayer times and giving praise for his progress--and to Bible studies and working on his relationship with God. But now he seemed agitated and angered by the night in the cold. "That's an option," I replied calmly, "but I remember what it looked like before. I would worry about who's in charge. You or the drugs." He glared at me, "I think I could control it this time." "It's an option for sure," I repeated after a while. We both stared at the ground. I looked up and said, "What if the person who rescued you were Jesus?" Oscar swung his gaze to meet mine "I'm so tempted to do drugs. It hurts so much. I'm so cold." I answered, " I know. I'm sorry. But you do know that whatever you are tempted to do, Jesus was tempted, too? Satan tempted Him in the desert with no food or water three times. And Jesus said, 'No' each time. And then he said, 'Go away from me.' And Satan left him. But not for good. He left him for a more opportune time. That's what it says... a MORE OPPORTUNE TIME." "Later in Hebrews, we learn we have a Savior who is not so high and mighty that He doesn't understand. It says He was tempted in every way. So Jesus knows! There is no shame in being tempted. Nothing He doesn't fully understand. No choice He hasn't made Himself." We stood for a bit. Oscar began to smile. Giving me a big hug, he exclaimed, "Satan is so tricky! It's just a matter of perception. I'm so glad we could talk. A change of perspective is all I needed." We do not have a Lord who considered himself above all things. He emptied himself out, even to the point of death on a cross and separation from His Holy Father through our sins. And He was tempted in every way but was found to be without sin. Whatever you think is a sin, if you trust Hebrews, Jesus was tempted to do it. Whatever our clients have gotten into, Jesus was tempted to do the same. We could not be in ministry if we didn't have such a Lord! On that cold morning, I expected grumbles and I was greeted with hugs. I encountered many smiles and laughs that icy morning. Something about making it through the dark and cold into the morning. Oscar ministered to me as much as I to him that morning. This Holy Week can be like that icy night. Make yourself go through the dark of Good Friday and into the morning of Easter with big smiles and a change of perspective. P.S. The two photos were taken the same day. Just a difference in perspective. 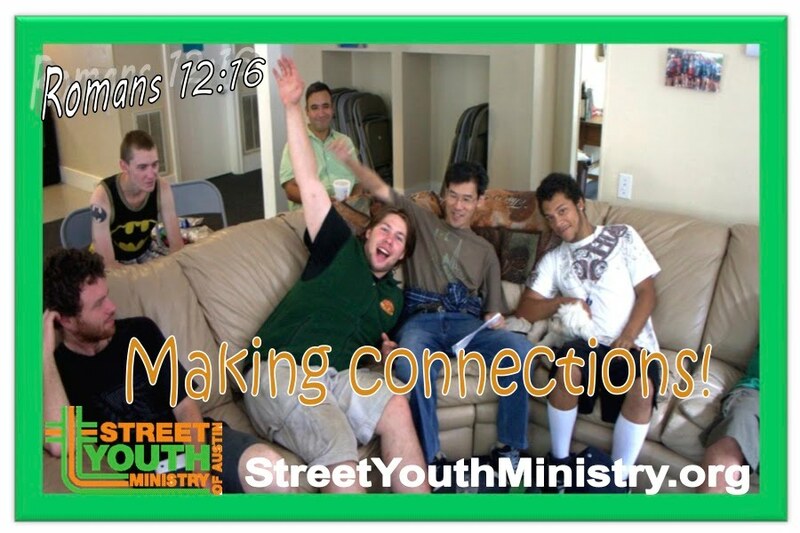 As Street Youth Ministry (SYM) grows, we're pulled in lots of directions. We provide the usual things--food, clothing, guidance counseling around topics like drugs, mental health, jobs, housing, and more. These things don't define us--as important as they are. W e must be known by how we do something else. It was very apparent--and a bit out of the blue--during our Tuesday Bible study recently. 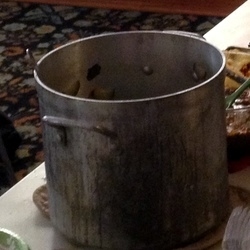 The soup had been left out accidentally by a group who shares a fridge with us, so no soup for the buffet. We doubled up on sandwiches made by youth from a church. We started late and had less than the usual number in the room: a rag tag dozen young people from 18 to 28 years old, almost all of whom sleep outside and somehow manage to get by from day to day. 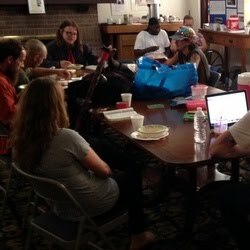 After they got food, we began a discussion on God's providence and thanksgiving, a topic I had chosen in advance with scriptures to read for reference. God?" He told me that God has helped him in the past with depression and addiction but that he feels distant from God and isn't sure how to get closer now. We spent some time thinking about where he feels closer to God: meditating, being in the woods, reading the Bible. I gave him one of the Bibles to take. street setting. It complains bitterly about God feeling far away for a few verses and then says, "but you have been faithful." It complains about being terribly mistreated by people and then returns, "but you are God who has done all." The young lady loved the prayer and discovered a new way to interact with God authentically, leaving with new spark and a new capability. We may do the things a homeless ministry usually does--things like food and clothing, but at our core is restoring hope and reopening the door for our clients to faith in God. We long to see that spark reignite in each of our clients. It's what we labor for, pray for, and wait for! Whatever you long for and wait for this Advent, we pray you receive it. Blessings on you and yours! Browse our quarterly newsletters by clicking the links below. Please share the email by forwarding a link or posting it in your social networks! December 2013 - Do You See What I See? December 2012 - Why Do You Do It?